Gadget apologized too often for the shoes. Devin told her it was all in the line of duty, and turned to face a more unpleasant challenge. Devin’s nose wrinkled as he stepped through the entrance to the Rangers’ devastated hideout. As the door was off its hinges and propped precariously against a nearby wall, he had the eerie sensation he was stepping into the empty eyesocket of a withered skull. For clearly, whatever good and wholesome had filled this place, it had been gouged out violently. Devin’s mind helplessly played back old images from a preparatory class at Rescue Aid Society—of a jumbled wreck left by a human psychopath and his particular pack of lunatics. There were no dead bodies here, but the air held a similar wrongness. He shivered, glancing over the profane and sloppy paw-printed words smeared on the walls; curses to the Rescue Rangers and tributes to all things evil. "Special Teams would need to photograph every square inch of this place," Devin gulped. It all looked like evidence to him, from the ruined audio/video equipment to the lopsided remains of the furniture. Gadget scared him nearly out of his fur, tapping a freshly-bandaged paw on his shoulder and making him jump like a miniature kangaroo. "Pretty spooky, huh? Oh, jeez, I didn’t mean to—breathe, silly, or you’ll be the patient!" She guided him down to a burst, shredded couch cushion, probably the softest thing left to sit on. "Whoosh! I don’t think I’d want too much of this air in my lungs. I mean, Marilyn Manson—Charles even—might feel at home in this godawful place, but I feel sick." Devin gasped smoke-tasting air and craned his neck around in disbelief. "We did a lot of good work here, the boys and me," Gadget said apologetically, making as if to sit down. Devin absentmindedly pulled half the stuffing from his cushion and bunched it up for her. She smiled graciously, if still a bit woozily, and sat next to him. "So, I take it you disapprove of the decorators." She shuddered again at the ugliness of the transformed room, covering her eyes and batting at the sight with one paw as if she could make it go away. "I’m certainly not booking them for my next party," Devin decided. "Even if it’s a Halloween party. The only booking these guys need is into a jail cell, or a nice bright padded room." Devin turned as a voice called out from a shadowed hallway. "Gaddit? Izzit docker?" it ventured, sounding full of effort and confusion. Whoever it was, the voice continued to try to get questions out, warbling something off-key and urgent. "That would be Runner," Gadget said, dusting herself off and gesturing for Devin to follow her. "Squirrel. He had—well, I gave him—a head injury, concussion maybe, and his speech comes and goes." Gadget walked calmly toward the sound of the squirrel. "Better see if there’s any swelling." Devin kicked his way free of the remains of the cushion, and cautiously advanced toward the hallway Gadget (without the slightest hint of fear) had entered ahead of him. Devin was sure something was going to jump out at him, fall on him, or whisper his name in a low raspy chuckle, but none of the expected horror gimmicks came into play. It just got darker as he went in. Runner lay very still on the lower bunk of the bed, watching the doorway with large and frightened eyes. 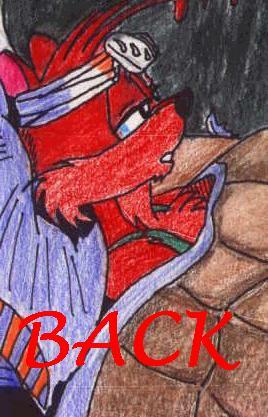 He relaxed as Gadget knocked and opened the door a crack. "Hiya, Gadit, izza dokker—" he frowned, thinking hard. "Did you get a doc-tor?" he managed, fairly clearly. Gadget quickly stepped to his side and adjusted the cold compress on his forehead. "Shh. Yes, we have a doctor here now. We’ll have you back on your feet and talking in tongue-twisters in no time," she assured him. Devin stepped in, tapping his medical bag and smiling. Runner shot a dubious glance at Devin. "Verry new dokker." Devin nearly stumbled, taken aback. "Not that new, sport," he chuckled. "This is my first house call, but I’ve seen a lot of patients." Devin came up beside Gadget and lifted Runner’s damaged arm. "Bruises and scrapes," Devin noted with a click of his tongue. "Nothing too nasty. But I hear your head hurts, eh?" Taking up a corner of the cold compress, he gently parted the fur on Runner’s forehead as the young squirrel flinched. "Easy, easy." "Devin. You can call me that, or Doctor Packard." Devin pulled back the covers and examined Gadget’s effort to splint the young squirrel’s broken leg. The leg was a mess, but the splint was a first class job. Devin’s eyebrows quirked with surprise at yet another example of Gadget’s far-flung expertise. Runner began snickering under his breath as Devin looked him over. "That doesn’t tickle, does it?" asked Gadget. "This isn’t exactly fun and games." Runner shied away from the cold stethoscope, but Devin pinned him down and listened intently. "No, dokker’s name, Packer. Perliss Packers, emma feefs stole alla cheese, all over belitishun—tebilshibin—on the T.V. newbs." Runner squinted at Devin again, nodding in recognition. Devin frowned and folded his ‘scope, then gingerly felt around the sides and top of Runner’s skull. Gadget scratched her head. "Do you know what he’s babbling about?" Devin rapped Runner’s head gently—but not too gently—with his knuckles. "No idea, he sounds confused to me." Runner gave him a dirty look. He wasn’t fooled for an instant. "Well, Runner," Devin went on, "you took sort of a glancing blow. No real swelling, so your noggin’s not too scrambled. Do you hear the way you sound?" Runner rolled his eyes and nodded furiously. "Woorgs come ow funny suntimes." "I’ll bet that’s driving you nuts. I don’t think it’s the bump on your head, though—"
Runner shook his head solemnly. "Gags. Poysn gags." "I think he means the gas in the tunnels," Gadget translated. "That’s what—what killed my friends. It almost got Runner and me both, and he got a whiff of it—nerve damage, maybe?" Devin looked at Gadget with a renewed respect. This wasn’t just a damsel in distress, he reminded himself. This was a living legend, a Jill-of-all-trades, and she had just reminded him of the medical knowledge bouncing around in her multi-talented brain. "Good call, Gadget. That’s what it looks like to me, too." He turned his attention back to the fidgeting squirrel. "Okay, pal, you’re going to have trouble talking for a while, but just keep trying. Maybe you could write, if we find something in this mess to write on, okay?" Runner grinned and nodded. "Lossa worgs I can grite down. Ten, twenny, maybe." Gadget laughed and smiled. Devin quietly basked in the glow of that smile for as long as it lasted—it fit her better than the frazzled or downright gloomy looks she’d worn since they’d been inside. "Well, that’s a start," Gadget offered, and patted Runner’s shoulder. "Runner," the squirrel admonished him. "Trigga sha horsh." "Runner, then. I’ve got to go over some things with Gadget, so we’ll just let you rest, okay?" Devin eyed the door nervously. 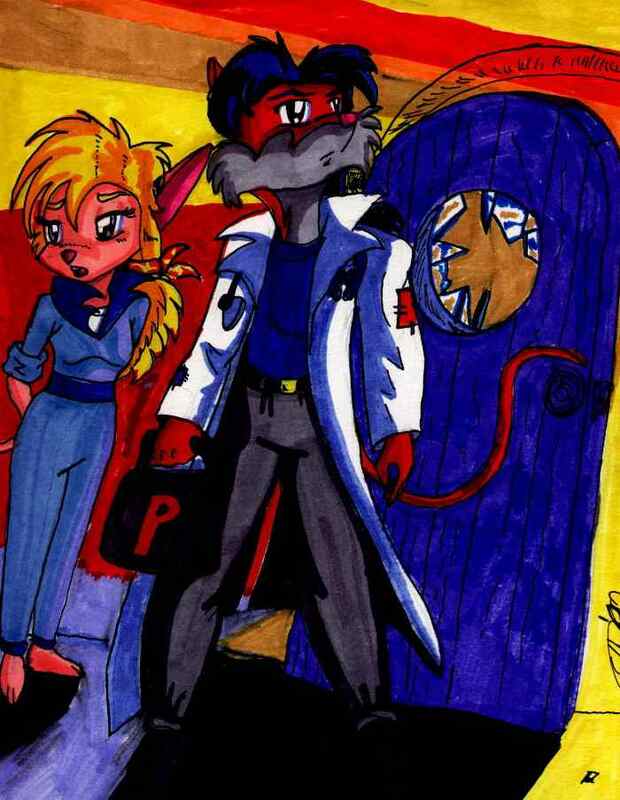 He did not like this place, but there were things he and Gadget would have to look at for his report. "Okay," said Runner, and snuggled back into the covers. Gadget tucked the blanket around his shoulders and he was settled comfortably. 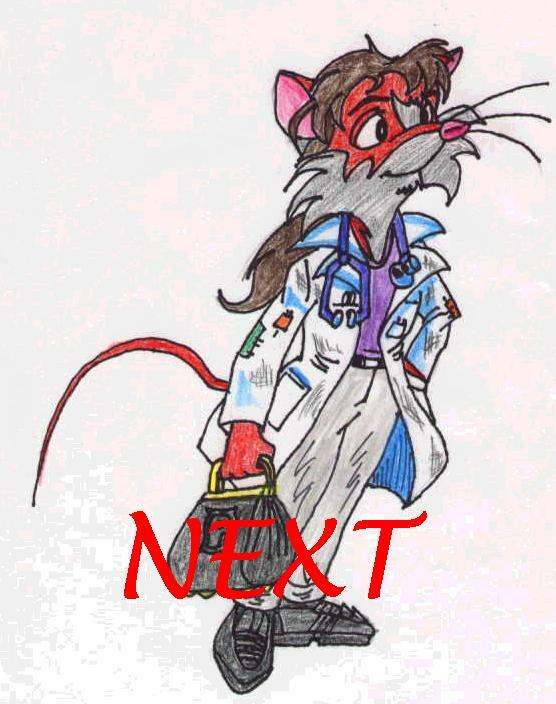 He closed his eyes, so Gadget headed for the door as Devin put things back in his medical bag. Devin stood to leave too, but Runner shot an arm out and grabbed his jacket. "What the—well, you’re pretty sneaky, Runner." "Yeah," agreed the young squirrel. "Um—abow Gaddit? "What about her?" Devin cocked his head, amused and touched at his patient’s concern. Runner thought hard, mustering all his concentration. "Be cafull with her. Someting wrong, she walk aroun’ all dark n’empty. Not jussa losing her frens, some bad else." Devin gently pulled Runner’s paw loose from his jacket and covered him again. "I’ll be careful. If anything’s wrong with Gadget, we’ll find out." "Hope so." Runner closed his eyes, headed for some real sleep this time.